To make this Fall cake, I used the Wilton petal pans and one cake mix. Let cool completely. I iced with buttercream and smoothed with a Viva paper towel. I used orange buttercream for the border on top and bottom with a round tip. And I used a small round tip with green for trim as well. I used brown buttercream with a round tip for the tree branch. Also, I made oak leaves and acorns out of fondant. Join in and write your own page! It's easy to do. How? 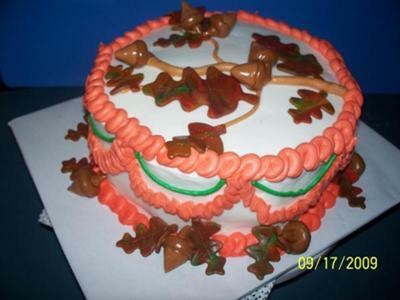 Simply click here to return to Holiday Cake Designs.